My Typo Humour: Sittingbourne Carnaval. Expexted delays. One of our regular contributors has just sent this in, taken from the BBC News Kent website. The text of the BBC News article reads as follows. 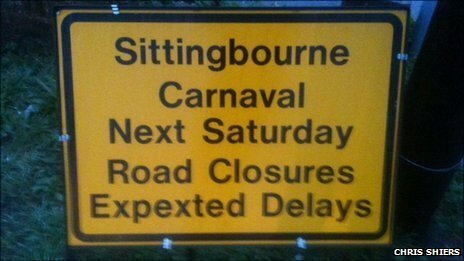 Several signs warning people to expect traffic delays during a local carnival are to be changed because they contain spelling mistakes. The signs which have been placed around Sittingbourne refer to the town's "Carnaval" and warn motorists of "Expexted Delays". Sittingbourne Carnival Association said it had to announce road closures a week before the event despite the mistakes. Pam Griggs, from the association, said the signs would be replaced or changed. She added: "People will either think we are stupid and we can't spell or they will have a good laugh. "At least people are reading them." The signs were manufactured by a printing firm from outside the area. Sittingbourne carnival takes place on Saturday. Thanks very much for sending it in, Jon.